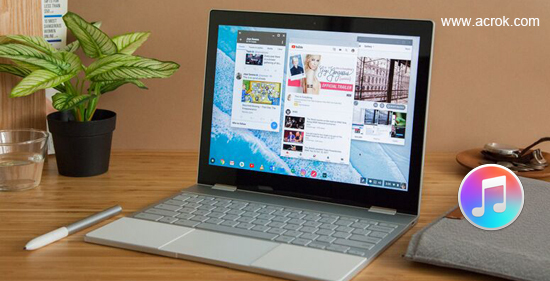 Google Pixelbook is a popular laptop on the market, it is one of the best Chromebooks you can get. It runs fast, you can install many apps on it to use. The Google Pixelbook is well designed and it looks very good. You can open this laptop up past 180 degrees, or use its touchscreen as a tablet. The base Google Pixelbook is very powerful, it has 8GB RAM, Intel Core i5 CPU, and 128GB SSD storage. It is a good laptop to choose. As Google Pixelbook is so excellent, many users have purchased it and take it everywhere. Google Pixelbook is only 10.3 mm thin, and it is equipped with an all-day battery. Google Pixelbook is easy to use, you don’t need to speed time to learn it, you can begin to use it immediately. This excellent laptop always has the latest security and features with software that updates automatically, you can save time and do more of what matters most. As an easy-to-take laptop, many users are looking for the method to transfer iTunes movies from computer to Google Pixelbook for watching on the go, in the content below we will share the best way to help you watch purchased iTunes movies on Google Pixelbook. Just like the question showed above, if you are a movie fan and have various movies and TV shows purchased or rented form iTunes, you may also have the need to play these iTunes videos on Google Pixelbook, you must be too impatient to wait for this excellent laptop to open your digital life, but please don’t worry, before you transfer movies from iTunes to Google Pixelbook, you have to know that the purchased iTunes movies and TV shows are protected by DRM technology, under the Apple DRM protection you will not be able to play iTunes movies on Google Pixelbook or other unauthorized devices, you are limited to play them on Apple authorized devices. But please don’t worry about this, though iTunes movies and TV shows are protected and you can’t play iTunes movies on Google Pixelbook directly, the lucky thing is that this annoying DRM protection of iTunes is breakable. Now you just need to use M4VGO software to break DRM protection and convert iTunes M4V to Google Pixelbook compatible formats, such as MP4, MKV and so on. On the market there are few programs that can remove DRM limitation from iTunes purchases and rentals, if you are the new to this field you will need to spend much time to make the right decision on which program to choose. In order to save your time, we would like to recommend the best iTunes DRM removal for you, the software is called M4VGO, it offers the best iTunes conversion service for you, this program has built-in DRM decryption technology, iTunes to Google Pixelbook Converter enables you to remove DRM protection with zero quality loss, and convert M4V movies from iTunes to Google Pixelbook supported formats. What’s more, you are allowed to convert iTunes DRM movies to any other devices for watching freely, such as Samsung Galaxy S9, Android tablets, HDTVs or other hardware players. Now please follow the step-by-step tutorial to remove protection from your iTunes movies and TV shows, and then you can iTunes movies on Google Pixelbook without any limitations. Step 1. Download M4VGO for Windows or M4VGO for Mac from the link, both Windows version and Mac version can convert iTunes to Google Pixelbook supported formats. You can choose the Windows version or Mac version according to your need. Step 2. Add iTunes movies to M4VGO. Launch the M4VGO iTunes movie converter tool, and click the “Add Files” to load iTunes M4V videos to this iTunes converter for conversion. Or you can also drag and drop the iTunes media files to this program. Step 3. Set the output format for Google Pixelbook. As you can see, in this iTunes to Google Pixelbook converter there are many optimized output formats, Google Pixelbook supports MP4 format well, so you can recommended to choose “Common Video -> H.264 MP4 Video (*.mp4). If you want to output other formats, you can tab the “Format” option to choose the format as you want. 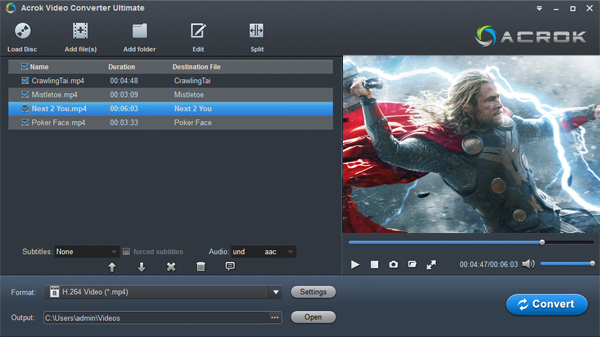 In this step, you can also choose the destination folder, you are recommended to output videos to the disk that has big space. Step 4. Start to remove DRM from iTunes M4V movies and convert iTunes movies to Google Pixelbook. When all settings are done, click the “Convert” button to start the conversion process. M4VGO software will start the conversion immediately, it will remove DRM protection from your iTunes movies or TV shows, and then convert iTunes movies to supported formats that you want. When the conversion is finished, click “Open” button you will find these converted iTunes movies are in the destination folder. Connect your Google Pixelbook to your computer with the USB cable, and then transfer these converted iTunes movies to Google Pixelbook through USB cable, now you can watch purchased iTunes movies on Google Pixelbook freely. If you want to play iTunes movies on other devices (Galaxy Note 9, Moto G6, LG V35 ThinQ, OnePlus 6, HTC U12 Plus, etc. ), you can also transfer converted iTunes movies onto them, and then you can play iTunes movies on any playable devices freely, there’s no playback limitation anymore. Previous How to watch iTunes movies on Galaxy Note 9?